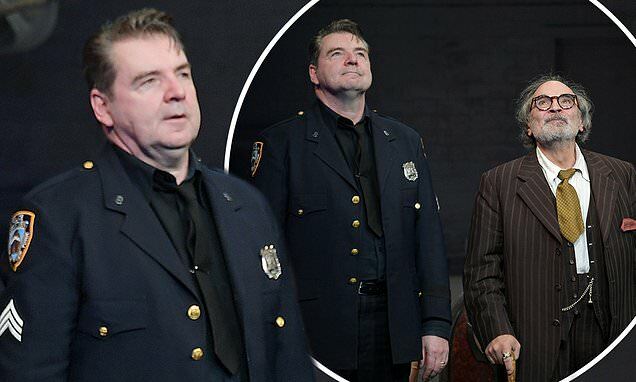 Brendan Coyle enjoyed a warm reception from theatre-goers on Monday evening as Arthur Miller’s The Price settled into its new home in London’s West End. The Downton Abbey star has stepped back into the shoes of Victor Franz for the director Jonathan Church’s revival of Miller’s lesser-known play, some 31-years after it first launched on Broadway. Previewing at Wyndham Theatre, where it will run until April 27, cast-members Coyle, 56, David Suchet, Adrian Lukis and Sara Stewart won notable praise for this ongoing 50th anniversary relaunch. Dealing with complex family dynamics and the concept of price - both literally and figuratively - Miller's play tells the story of brothers Victor and Walter, who reunite in their former childhood home following the death of their father. The pair are immediately at odds due to their vastly different social standing, with Coyle's Victor an unpretentious police offer confronted with the affluence afforded successful surgeon Walter, played by Lukis.